In November of last year, this column featured a story on the relatively new discipline of Western Dressage. 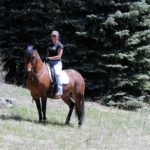 Two readers wrote in to take a free Western Dressage lesson sponsored by Andrew at MtnHomes4Horses.com with local instructor, Kelly Hendricks. Last year, Kelly completed the Train The Trainer TM program through the Western Dressage Association of America, giving her the tools to help teach others the foundation behind Western Dressage. Denise was one of those readers and grew up riding all over the mountains of Conifer with her Grandfather. At nine, Denise started riding with the Westernaires. Her parents bought her Grandfathers horse property in Conifer when she was twelve, allowing her to get her first horse Sasha, a yearling Arabian filly. She became Denise’s 4-H mount and trail horse. Denise and Sasha formed a lasting bond as they explored the same mountains that her and her grandfather had once ridden together. As Denise progressed in Westernaires, she continued to ride their string horses, which gave her an opportunity to ride a variety of horses in many ways during those ten years. For the last five years with Westernaires, she rode in the National Western Stock Show as well as traveling throughout the United States performing. At several shows, Denise was the featured sidesaddle rider and she also performed with the Varsity drill team. Denise’s daughter Jaden, now in medical school, started in Westernaires at twelve. She too rose through the organization to become a Precisionette, elite Varsity rider and performer at the National Western Stock Show. They found two amazing horses for Jaden to perform on, Slider and Rio. While Jaden rode, Denise coached all levels of Westernaires from Tenderfoot to Precisionette. She was thrilled to be connected to horses again after being away from them while she raised her two kids. Westernaires also gave her and Jaden an opportunity to form a tight bond through their mutual love for horses. Denise’s life then changed drastically when her husband of twenty-five years filed for divorce and moved to California. As a single mom, with her son at home, she decided to move back to her hometown of Evergreen to rebuild her life. Determined to keep horses in her life, she was able to hold on to Slider, who was now aging and needed a companion. That is when she found Drifter, a Hancock-Driftwood bred three-year-old gelding with a calm, laid back personality. Drifter entered the picture right around the time the Western Dressage article came out in the Colorado Serenity. 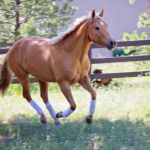 After reading the article, Denise went to a Western Dressage demonstration at the National Western Stock Show in January and decided to email about the free lesson. Western Dressage seemed to be the perfect way to get a young horse like Drifter engaged, using his body correctly and learning what would be expected of him. With sporadic riding over the winter, Denise and Drifter took lessons when they could and as the weather warmed up and the days became longer, they had more time to work on their assigned skills. What I wasn’t prepared for was the transitions and knowing where those were within the dressage arena. I understood how to do that in a drill team setting – but the dressage arena and markings were a foreign language to me! I went home from the clinic and re-wrote the dressage test instructions to make sense to me in my drill team thinking brain. I walked it through in my pasture and felt fairly confident the day of the test that I had it memorized. But boy was I nervous! I had been riding my whole life and had performed in front of huge audiences – this was just one judge. But I wanted to do well – for myself, for Drifter and for Kelly. She had told me the day before at the clinic that any score over 60% was something to be proud of. It didn’t sound all that good to me – but if she said it was good – I believed her! The ground was still so wet from the flooding the week before. But Drifter handled it all like a pro. He moved into the transitions when I cued him and stopped when I asked him to. At the end, the judge came out into the ring to give me some tips. At that point I told her Drifter was only 4. She was shocked and surprised at his demeanor and his willingness. She gave me some cues on getting him more collected and rounded – things I am still working with him on now. I went home feeling good that I didn’t make any huge mistakes and pleased with Drifter’s performance, never imagining that I would receive a score of 64% and 3rd place overall! What an accomplishment for someone who had never even heard of Western Dressage until 9 months ago and just started training her young horse. I was very pleased! I will continue to work on Western Dressage with Drifter. I feel it is such a good foundation for all horses – regardless of the discipline you intend to move them into. I still plan to move him into reining when he is ready, but continue with his dressage training throughout his lifetime. Denise and Slider ride with the Evergreen Rodeo Drill Team. Additionally, Denise works as a coach and consultant for other drill teams around Colorado and Wyoming. Heather McWilliams © 2013. We recently hauled a young horse from Colorado to Texas for a friend to ride for the winter. It reminded me of some things to think of before hand and on the way. Health Certificates are good for 30 days now, so get one about 3 weeks ahead of time from your veterinarian. This way, if your horse needs any vaccinations, it gives them time to build immunity and be past any problems. At the same time, make sure that you have a current Coggins on your horse and get them any vaccines they might need for the new location. I normally do not give my horses Flu/Rhino in the winter because they are not around any other horses, but with our young horse going to a training barn with horses coming and going, I made sure she was up to date. Rabies is important to give horses in Colorado too, but infected animals are commonplace in Texas, so she received a Rabies vaccine too. My veterinarian uses Rhino/Flu and Rabies from the same manufacturer, which has not caused any reactions to date. Check the areas that you will be going through or to, so you know what vaccines may be necessary. Potomac Horse Fever is one that is important in the eastern United States. 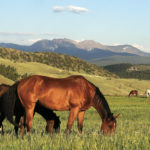 Brand Inspection is important in Colorado for horses traveling over 75 miles. I decided just to get a permanent card for all of our horses since they all may be traveling in the future. Holly Golen is the Brand Inspector for our area. Click here for their website, contact information and guidelines. People have different preferences when hauling, but we like to keep a day on the road to about 6-8 hours of road time. We give the horses breaks every few hours by stopping for a hour or so to eat or see some sites. The horses get plenty of exercise keeping their balance in the trailer, so having a chance to stand, drink and rest is important. They do not need to come out of the trailer. We offer water at all stops and leave it with them, taking note of how much they are drinking. We bring water with us, but mix it with new water as we go. We keep hay in front of them to keep them busy using a small hole feed bag, so they eat small amounts over a longer period of time. On this trip we had a stock side, slant load, two horse trailer and decided to leave our one horse loose in the trailer with a half bucket of water. Interestingly enough to me, our horse and the young horse we brought back with us for a friend both usually rode like they were tied in the first slant stall. Usually, I have heard and seen that horses will turn around and ride facing backwards… If your horse is tied, make sure they have enough slack to put their head down and cough. Leg Protection – In general, for long trips I like to bed my horses about 8″ deep with shavings. This gives them shock absorption and protection. Certain horses may need to have standing wraps on if they are prone to stock up, have previous injuries, are coming back from an injury or may be unsettled in the trailer (kicking/pawing). If I had to pick one type of protection outside of deep bedding, I would go with bell boots on the front and back. As horses balance, this protects them from stepping on themselves or each other. Overnight, we like to find a stall for them to rest, eat and drink. Smart phones are great for finding a place to stay while you are on the road and get a feel for where you might stop. On the way down we stayed at the Saline County Fairgrounds in Salina, Kansas and on the way back we stayed in Hays, Kansas – the horse at a stable we found on horsetrip.com. There are also listings on horsemotel.com and travelinghorse.com. Happy travels! Heather McWilliams © 2013.